Nikon has announced three new superzoom bridge cameras, the Coolpix P510, the Coolpix L310 and the Coolpix L810, featuring up to 42x optical zoom. First up, the Coolpix P510, which houses the 42x optical zoom lens, also features a tilting 921k dot LCD monitor and full HD video recording with stereo sound. Along with HD video, slow and fast motion movies can be captured with speeds of up to 120fps (VGA). Movies can also be shot in iFrame format, while an inbuilt HDMI connector means you can hook up the camera directly to an HDTV. Built in GPS is able to record the exact location a picture was taken. Other features include Auto HDR mode, Easy Panorama mode, 3D shooting mode and high-speed continuous shooting at up to 6fps. The second camera, the Coolpix L810 offers a 26x wide angle zoom lens, a 16 million pixel CCD image sensor and four different automatic anti-blur functions. It is capable of recording HD video at 720p and unlike the P510, is powered by AA batteries. Other features on board the L810 include 3D shooting and a smart portrait system which features the ability to take a picture when the subject smiles and provides blink warnings. Finally, the Coolpix L310 offers a 21x optical zoom lens, with a 14 million pixel CCD sensor. HD video recording is available at 720p, and is accessible via a dedicated movie-record button. Specifically targeted at novice photographers, the camera includes 17 scene modes, along with a Scene Auto Selector for automatically choosing the best scene mode for any given situation. Smart portrait mode is also included in this camera, featuring Smile Timer, Blink Proofing and Red Eye Fix. The L310 is also powered by AA batteries. All of the cameras are bundled with the View NX2 editing software, and all feature an EXPEED C2 processor. 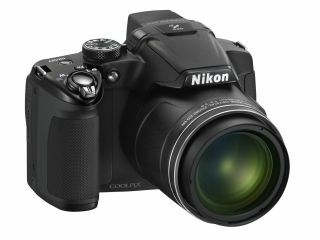 The Nikon Coolpix P510 UK price will be around £399.99 and will be available from 22nd March in black, red and dark grey. The Nikon Coolpix L810 UK price is around £229.99 and will also be available from 22nd March in black, red, blue and bronze. Finally, the Nikon Coolpix L310 UK price will be £199.99 and will be available from the 15th March in black.